‘God never repeats himself.’ – Rabbi Nachman of Bratzlav. The rarest fancy-coloured diamonds – red, blue and green – might at first sight seem to duplicate the ruby, sapphire and emerald, but close examination reveals that they are quite different from other coloured gemstones. Only one in a hundred thousand diamonds has a deep enough natural colour to qualify as a ‘fine, fancy-coloured diamond’. 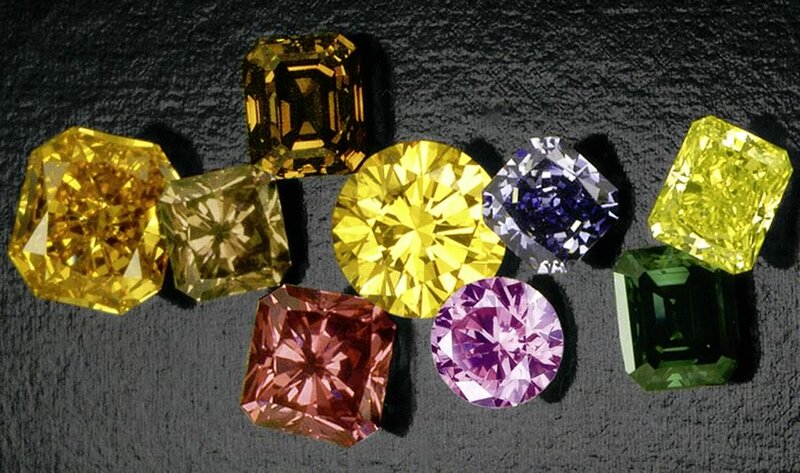 Gemmologically, minute traces of various chemicals give rise to different colours in diamonds. Traces of nitrogen will give rise to yellow stones while blue diamonds have traces of boron. Are all fancy-coloured diamonds natural? There are techniques for transforming off-colour white diamonds into fancy colours. This has been done as early as 1904, when scientists subjected diamonds with radioactive treatment, known as irradiation. Gem testing laboratories are usually able to confirm the origin of fancy-colour diamonds. What is the difference between fancy-coloured diamonds and gemstones? Fancy-coloured diamonds possess a distinctive look not found in other gemstones. Unlike any other gem, the diamond has the ability to disperse each ray of reflected light into a rainbow of colour. How do you differentiate between shades of fancy-colour diamonds? Fancy-colour diamonds fit into many categories, depending on the strength of the colour. Words such as faint, light, rich, deep, intense and vivid are frequently used to describe the degree of colour in the stone. When judging fancy diamonds, colour is king! Where do fancy-coloured diamonds come from? The majority of reds, blues and greens originated from the historic mines of India, with most yellow and brown diamonds coming from South African mines. South Africa has a large output of diamonds, but the number of fancy-coloured stones produced is quite small. Colours can vary from the more common yellow and brown to green, purple, pink, red, blue and black. Pink is especially rare. Although black diamonds have the lowest value among coloured stones, they are becoming increasingly popular as a combination with white diamonds. The Tiffany Diamond is a magnificent 128 carat ‘fancy intense yellow’ or ‘canary’ yellow, mined in 1878 in South Africa. The other well-known coloured diamond is also from South Africa, the blue Hope Diamond. Thanks for Your Support Have You Tried The Tooth Test?